Which is in no way an argument against anything I said. I've won games with punishers. They're still terrible. As a stand-alone ship they may be lacking a bit but as part of a squad they look pretty good to me. See previous comment, really. As part of a squad, they are worse than any of the many options for the same points. In particular, the Gunboat. You'd be daft to pay for a Punisher when a Gunboat does the same thing only better. Very similar to what I was thinking. The advantage of something like this is it makes the ship unique. Also, lets you go all out and thus not take away from the disposable nature of imperial forces. As a stand-alone ship they may be lacking a bit but as part of a squad they look pretty fun to me. Fixed it for you @pooleman, haha! Actually, they do make up a fun squad running three; problem is it is so very well balanced, and can only be playable when flying against equally balanced ships like T-65s, Y-Wings (minus TLT of course), HWKs, K-axes, etc. In addition, in the Epic setting, they can be useful and quite fun when again, running balanced ships. 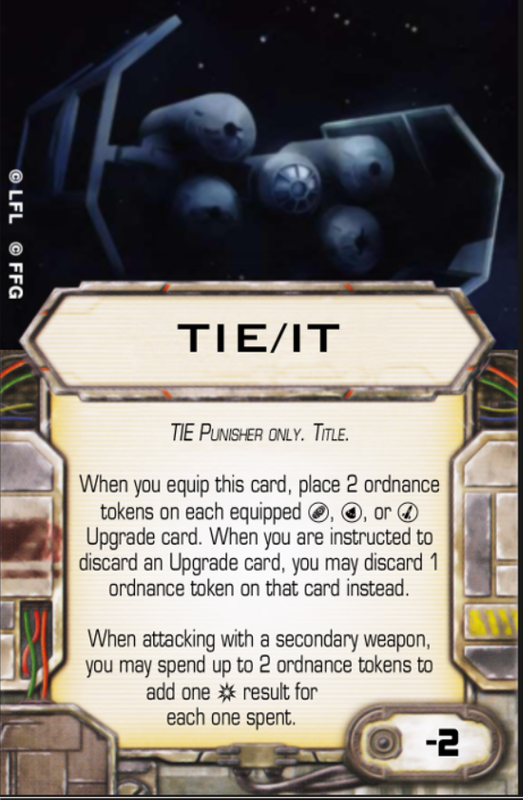 There is a fantastic Punisher Mission that @heychadwick and the guys from the Shuttle Tydirium created along with a guy I think is called "Punisher Jason" who may be --besides TIE MkII upgrade-- the only real reason FFG continues to sells any of these clumps of plastic. I do own three thanks to the mission really, as we proxied TIE Bombers as I only had one at the time; but I fell for them and have a trio that is uber-fun and just at the balanced level with lightweight frame, unguided rockets and bomb of choice on board...... @thespaceinvader is correct though, why run a Punisher when you can run a Gunboat that's simply better in every way. With Trajectory Simulator and Bomblet the punisher just seems like a decent ship to me. Lightweight frame gives it the extra evade. Maybe I'm just naive. TSim and Bomblet is trivial to avoid. You just don't joust it. It's not even close to a fair trade-off. Turret gives you wildly increased targetting capacity. Missile gives you 0 extra targetting capacity, especially on a ship that is more than liekly to die before it spends all its ordnance anyway. System is valuable, but only when you're shooting usefully anyway, which at a maximum of PS7 is tough to arrange. My preference is Cheaper and Shootier, personally. Tough and tanky has been done to death and drags the game out. ANd any putative fix needs to take account of bombing as a viable strategy as well. Double tap ability. When secondary weapons would be discarded, you may choose not to discard them. Once per round, after attacking, you may make an attack with an equipped secondary weapon. Combos with FCS to give you targetting primary weapon, or double secondary if you've already got a lock, and saves you the points on EM. Bomb ability. When you discard a [bomb] upgrade to drop a bomb token, you may either drop two identical tokens, one using the 1 right bank, one the 1 left bank, OR you may choose not to discard the [bomb] upgrade card. Means you only need to bring a single bomb, and you don't need Bomblet at all to have infinite ones. Or, means you can double up COnners or Clusters, which is huge. COuld also stand some generic Imperial only damage buffs and TIE Only Imperial Only defence buffs too, not just for the Punisher but for everyone. Their biggest issue is that they don't fire dry/fire enough to account for their cost before they die. There are many ways to fix that, not just makign them tougher. Bombers and Punishers (and Gunboats) all tread heavily on one anothers' toes from a design perspective. Gunboats have the longevity and agile movement game down, Bombers should have the toughness game, which leaves Punishers with the shootiness and bombs game. ....which leaves Punishers with the shootiness and bombs game. This is it, the solution that makes them unique: add a title that gives many extra munitions and double-tap on secondaries, yes? Since @clanofwolves mentioned it, here is that Tie Punisher mission I made. I wanted to showcase the Tie Punisher in the way it was built, massive assault. So, screw point costs on the things and load it with whatever you want! Fully loaded Punishers! A Vaksai-esque title seems like all it needs to address most complaints. Ship too expensive? -1 cost of upgrades helps with that. Ship too weak, despite only being 1 HP weaker than a Scurgg? LWF and Autothrusters for 2 pts takes care of that, and you still have a slot for Guidance Chips to boost your ordnance. Bombers should not have the toughness game, conceptually they're supposed to be the cheap efficient simi disposable choice, the TIE Fighters of munitions, while Punishers are supposed to be the elite strikers for situations where you want every bit of explosives to reach the target without loosing a carrier before they deliver their payload. They're survivability specialists because in situations where you just need more boom you just send a larger number of Bombers, Punishers were designed to be able to reach their target 95% of the time and to be able to carry enough firepower to vaporize whatever that target is when they get there. Gunboats are not part of the regular Imperial compliment, they're designed as kinda a jack of all trades for outposts to small for the usual array of specialist ships to be cost effective. The Scurgg doesn't have the same issues of dieing before it does anything because it has a turret slot so it can't be arc dodged, can be PS 10, and doesn't require the huge investment in ordinance that the Punisher does because it has a three dice primary. The fact that it's arc locked makes any comparisons to the K-Wing or the Scrugg really dumb, it's like comparing the Lambda to the YT-2400 except if they cost about the same. I'm purely talking on the 'not dying end', obviously the turrets on the other ships give them a huge advantage. But having LWF + Autothrusters gives them a massive advantage over the K-Wing (except maybe Miranda) and Scurgg when it comes to not taking damage, and with a Vaksai cost decrease it would put a LWF+AT Punisher at the cost of a naked K-Wing generic. For 1 pt more, you could also give them Unguided Rockets to match the Scurgg's three dice primary at the same cost as a Scurgg generic, except with the discount on any further ordnance upgrades / system slot / third mod slot. I think some others here have said it well. Perhaps one of the fix(es) the Punisher is a free Reinforce action (front arc only) every time you may take an action. Obviously, it will need a little bit more, but giving it a title with a free half-action isn't so bad for a start. So I know I said I was going to buy a punisher and fly it and win with it but I’m not going to. I bought another TIE Inquisitor because I needed Guidance Chips. The punisher offers me nothing that I need. The fundamental issue the Punisher has is that it's functionally almost identical to the Bomber, except for the extra bomb slot and the System slot. 9/1 and 6/2 are so similar as to be almost indistinguishable. It swaps barrel roll for a worse dial and boost, and swapping EPTs and PS8 options for system is pretty much a null deal. So bombers and punishers will always be fundamentally very, very similar. Yeah that was a huge design oversight of the Punisher, one of many. The system slot could have allowed for a number of niche roles but most of them were blocked by the lack of an ept slot and even still wouldn't have made up for the drop in points efficiency, it's just too frail for an arc locked ship that costs as much as it does. With one agility, you could give the Punisher some free shields and it would be just fine. Once per round when attacking with a [Torpedo] or [Missile] secondary weapon you may discard 1 other [Torpedo] or [Missile] Upgrade card to add one [Critical] result to your roll. When dropping a bomb without the 'Action' header, you must place two of the appropriate tokens. One token must be placed using the 1 [left bank] template and the other token with 1 [right bank] template. When you equip this card, place 1 ordnance token on each equipped [Torpedo] and [Missile] Upgrade card. When you are instructed to discard an Upgrade card, you may discard an ordnance token on that card instead. When you equip this card, place 1 ordnance token on each equipped [Bomb] Upgrade card. When you are instructed to discard an Upgrade card, you may discard an ordnance token on that card instead. The first time you are attacked each round, you must assign a Reinforce token to your ship. If the attacker is in your Primary arc it must be a Reinforce Fore token, otherwise it must be a Reinforce Aft token. You may equip one additional System Upgrade. The way I would go about it is giving Punishers a permanent Reinforce but only in their 90 degree primary firing arc as others have mentioned. This gives them the durability they need while still allowing them to get outplayed... just flank them to disable their bonus. But let's be real here... even that won't be enough. They'll also need something similar to the Vaksai title to lower the cost of all upgrades and/or some form of infinite ordnance like the reload action and/or an EPT on the higher skill pilots. Director Krennic might be a good boost to the Punisher. 4 shields and the ability to delete a shield sounds good. Has anyone tried Tie Punishers in Epic? Miranda also has regen and SLAM. Punishers are arc-locked and not very maneuverable. They're super expensive and easier to kill than a TIE Bomber. Bomber has 6 HP behind 2 agi, Punisher has 9 HP behind 1 agi. The devs didn't really think about that trade-off. Even unmodified, the Bomber usually rolls about 6/8 of an evade whereas a Punisher rolls 3/8 of an evade (those numbers aren't exactly correct but they're close). Basically, when several attacks land on the same Punisher, it's just as easy to focus fire and kill as a bomber, at 5 more points for the base chassis and a worse dial. Fix priority #1 for the Punisher is survivability. There is no way anyone's going to take a 30-something point ship (at it's cheapest optimal loadout) that an opponent can lock onto and kill before it shoots more than once. That's why Punishers are a flat-out NPE to play with. Against a number of competitive lists, they're dead before they shoot. For example, 3 Harpoon Missiles are practically guaranteed to kill any Punisher. And then against something that doesn't barf 10+ attack dice at you and kill you before you shoot, you're going to get arc-dodged. Not sure how to fix that one, I think Punishers are meant to be slow and arc-dodge-able, but they definitely need to be beefier and harder to kill. More bomb slots and some really, really nasty options for bombs that only the Punisher can use wouldn't hurt either. I disagree that Punishers are easier to kill than Bombers. Consider a 3-dice attack with focus against one of these, range 2 and not spending tokens defensively. A Bomber suffers an average of 1.53 hits per attack, a Punisher suffers an average of 1.88 per attack. At this rate, it takes 3.92 attacks to kill a bomber. It takes 4.79 attacks to kill a punisher. That's almost an extra attack they can survive. It's not enough extra toughness given the increase in points cost, but let's be honest about the math. 9 HP on 1 Agility is tougher than 6 HP on 2 Agility. Even if we presume 3 hits every attack, a Bomber dies to 2.667 attacks, and a Punisher to 3.42. You say three Harpoons is an almost guaranteed kill on a Punisher? Two with focus/TL will kill a Bomber at least a 3rd of the time. Don't get me wrong. Punishers need help. Bombers might, too, since they're so much worse than Starwings for only 2 points cheaper. But this one really sticks in my craw. Punishers are not statistically easier to kill than Bombers. [Name invoking massive salvos] When attacking with a Torpedo or Missile, add one attack die. After attacking with a Torpedo or Missile, discard 1 equipped Torpedo or Missile upgrade or receive 1 facedown damage card. That's a good deal of extra-shooty, and here's the great thing! Extra Munitions is an equipped Torpedo, so you can chuck first the token, then the card itself to power two shots from other missiles. I'd like to see them get either cheaper or tougher, too.